February just flew by and March has been super-hectic, but I love it. Although the weather hasn’t been conducive to gardening, I’ve been able to create some items for upcoming shows and I could watch all the NCAA and NIT games into the wee hours without guilt! I am impatient for Spring to actually arrive weather-wise, and eagerly welcome each new spring bulb that pushes through the soil. We’ve entertained house guests, hosted parties, and celebrated birthdays. The basement is filling with baby plants and they are getting impatient for warmer temperatures so they can migrate into the little greenhouse. The potager beds are ready for planting, and showing bits of life here and there as perennials such as chives, rhubarb, Lovage and anise hyssop emerge. It’s an exciting month both indoors and out as Spring arrives and both Nature & the NCAA put on amazing shows, but I’m more than ready to get back to gardening! Hamilton Co. Master Gardeners’ Plant Sale: May 19, 8-3. Hamilton Co. Fairgrounds, Noblesville, IN. Allen Co. Master Gardeners’ Plant Sale: May 19 & 20th. Note hours are 12-2:30 each day. 4001 Crescent Drive, Fort Wayne, IN. Minnetrista Garden Fair: June 2-3 Dozens of quality garden décor and plant vendors, garden tours, speakers, food. We’ve had a hard winter, and I’ve spent any mild moments searching the gardens for signs of life. Imagine my surprise to find this large patch of green in the mulch near my greenhouse. Even in the cold, a gentle pinch released the unmistakable fragrance of chamomile. What a delight! 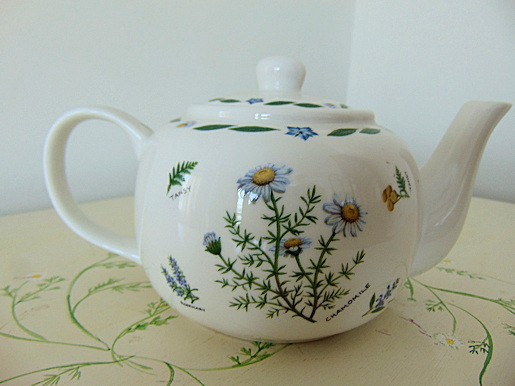 Chamomile has been used since the earliest times. It was one of the sacred herbs of the Saxons. The Egyptians praised its medicinal qualities. Although they had no way of knowing chamomile contains over 120 chemical compounds, they recognized its anti-fungal, anti-bacterial, anti-inflammatory and antiseptic qualities. Its original scientific name (Anthemisnobilis) comes from the Greek anthos, or “flower,” and nobilis, recognizing its “superior value.”In recent years it has been reclassified as Matricariarecutita. Its common name is derived from the Greek chamos, meaning “on the ground” and melos, or “apple” which best describes its scent. In Tudor times, it was a popular fragrant lawn or grown as a “cushion” on garden benches. Shakespeare wrote that “the more it is trodden on the faster it grows.” There is still a small chamomile lawn at Buckingham Palace. This hardy annual self-seeds readily if allowed to flower. This annual form, often called “Common” or “German” chamomile grows to about 18” in height in average soil and a sunny location. 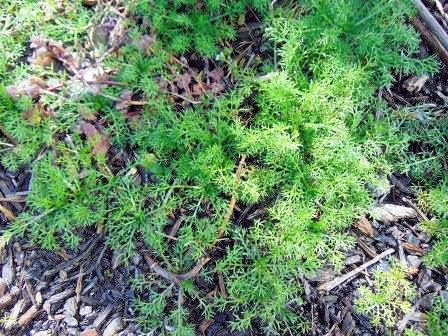 The foliage is bright green and very finely cut. The plant grows quickly, branching often to produce clusters of small, white daisy petals that surround a golden center. There is also a lower-growing form, “Roman” chamomile (Chamaemelumnobile) which is a half-hardy perennial reaching only 4-6” tall. This is the type most used for lawns, but it is only hardy through Zone 6, and seldom flowers. It is sometimes noted that other plants seems to thrive when chamomile is their neighbor. In fact, the Romans often called it the “plant’s physician” and planted it near sickly plants. Unlike many other herbs, it is only the fully opened flowers, not the leaves that are used in tea. The flowers can be brewed fresh or dried. Chamomile tea has long been prescribed as a restful beverage. Beatrix Potter’s Peter Rabbit was given chamomile tea and put to bed after his frightening escape from Mr. McGregor’s garden. It is also said to soothe an upset stomach, decrease stomach ulcers and irritable bowel, or help with menstrual cramps. Some find it relieves many allergy, hay fever, asthma and digestive problems. The tea can also be added to baths to help one relax, or as facial toner, for diaper rash, or as a rinse to lighten hair. It also aids in many scalp conditions. Chamomile flowers are sometimes used as a yellow dye, although since there are many other plants that yield yellow, it is generally more often used as a tea. 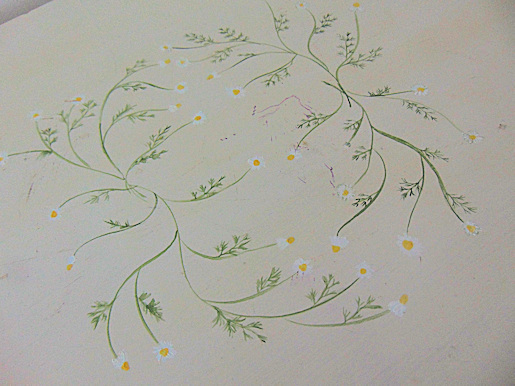 Chamomile symbolizes “energy during adversity” and it is the birthday flower for December 17. It’s time to begin fertilizing houseplants! 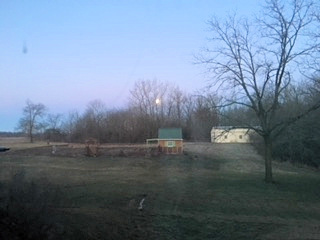 I usually get stocked up on organic fertilizers to begin on March 15. Check for insects, and pinch the tips or trim back sprawling growth. The plants will respond to the nourishment, and to the longer, sunnier days with new growth and a perky attitude! 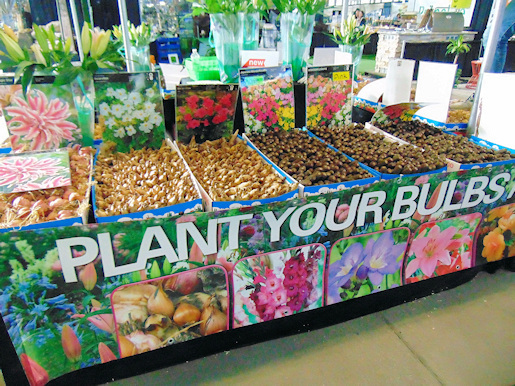 It’s also a good idea to spread a little fertilizer or compost on bulbs, such as crocuses, dwarf iris, tulips, etc. as soon as they finish blooming. I like to do it on a rainy day, so it is automatically “watered in”. That feeds the bulbs as they ripen their foliage, and builds up the bulbs so they will bloom even bigger and better next spring. I try to fertilize each clump as they finish, and stick a colored toothpick there, so I know it’s done. Otherwise I forget where they were, or if I did them or not. A warning, if you use granular chemical fertilizers and put it on foliage, it will burn the plants, often killing them. Use organic fertilizer, or you can use a diluted liquid fertilizer mixed with water. If you want cannas & dahlias to bloom earlier in the season, now is a good time to pot them and get them started indoors. They’ll bloom almost a month earlier than if planted directly outdoors after the soil is warm. You will need to harden them off gradually and don’t plant them into cold soil. March’s erratic weather can cause major frustration for gardeners, but fortunately there is an antidote. The Indianapolis Flower & Patio provides a bit of respite, a lot of inspiration, and a renewal of faith that spring will eventually arrive and bring with it a bounty of blooms and greening. Here are some of my favorite things from this month’s show. 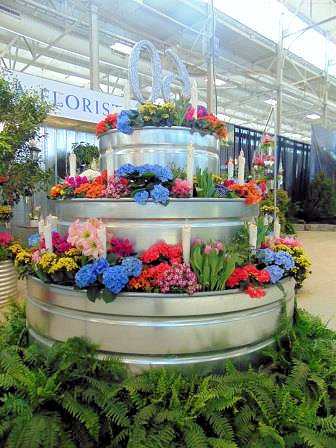 McNamara’s “Icing on the Cake” was the centerpiece of a very colorful booth celebrating the show’s 60th anniversary. Can’t you just imagine surprising a farmer or rancher with this layer “cake” made of livestock watering tanks? It taps into both the “Industrial” and “Vintage Chic” trends that are popular today, and surrounding it with hanging buckets of blooms made it magical. 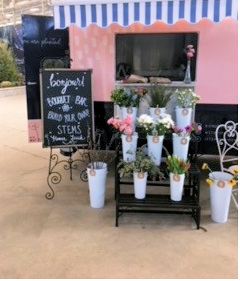 I love the concept of this mobile florist’s shop, “STEMS,” a French-inspired van filled with fresh flowers for “build-your-own” bouquets. 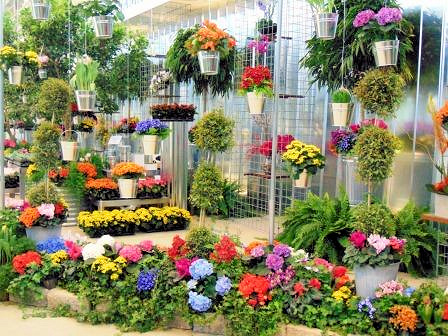 Similar to trucks found in European markets, it offers a unique experience by allowing shoppers to select just those blooms and combinations they love most. Completed bouquets are wrapped in kraft paper and hand-tied with twine. 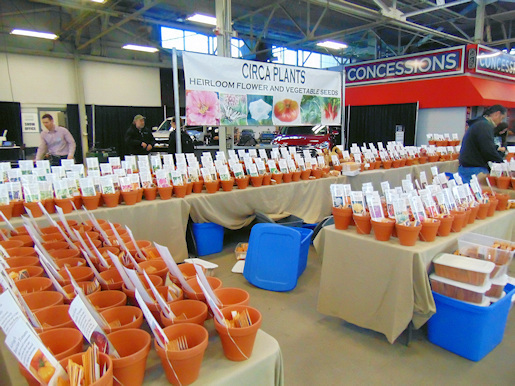 Of course there were lots seeds and bulbs available for purchase. Why is it that although the garden plan has been drawn in great detail and plans finalized weeks ago, we always believe there is still room for a few more plants or a few more packets of seeds? 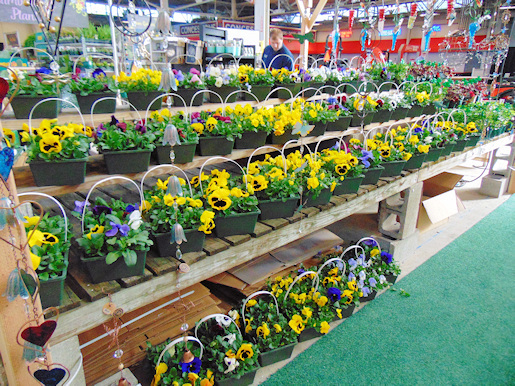 There’s always room for these cheerful pansy trugs to welcome guests to the front door, or as a hostess gift. 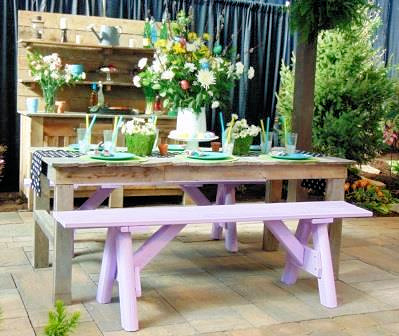 This outdoor Easter picnic setting was a delight for the eye. I loved all the attention to detail and pastel colors. For a closer look at the Easter ideas that inspired me, visit my blog post “Six on Saturday-March 17”at www.herbalblessingsblog.wordpress.com or you can access on it from this website by clicking on the “Garden Journal” tag under the website header. You’ll find lots of gardening info and inspiration there. I developed this tea for my third book, Herbal Passions. It is especially appropriate since hops is the Herb of the Year for 2018 and it’s perfect with the shortbread. You may want to schedule a nap afterwards! Mix all four ingredients together. If using dried herbs, use 1 tsp. of the mixture per cup of boiling water. If using fresh herbs, use 2 tsp. per serving. Preheat oven to 325. Combine 1 c. unsalted butter, ½ c. sugar and ¼ tsp. salt, beating until light and fluffy. Blend together the zest of half an orange; 1 tsp. dried chamomile flowers (simply open a chamomile tea bag and measure, if you don’t have dried flowers on hand!) and 2 ¼ c. flour. Stir into butter mixture, mixing until smooth dough is formed. Press into an 8x 8 pan. Bake 30 min., just until beginning to turn golden. Remove from oven and cut into 16 cookies. Allow to cool, then remove from pan.